Every January the POLICE staff heads to Las Vegas for the annual Shooting, Hunting, and Outdoor Trade (SHOT) Show. 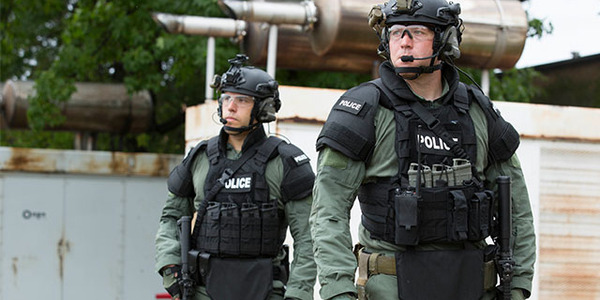 SHOT has become one of the world's largest shows for new law enforcement gear, apparel, and weapons. This is a look at what caught our eye at this year's show. Federal (www.federalpremium.com) introduced Syntech Defense ammunition at SHOT. Syntech Defense is a hollow-point bullet with a polymer coating that reduces wear on barrels, eliminating copper and lead fouling. Available in 9mm Luger 138-grain, .40 S&W 175-grain, and .45 ACP 205-grain. Federal debuted the polymer-encapsulated Syntech bullet in 2017. Hornady (www.hornady.com) has added .25 Auto and .32 Auto to its Critical Defense line. The FTX technology maximizes the potential of a hollow-point bullet. The FTX Flex Tip aids expansion and eliminates clogging when passing through clothing. 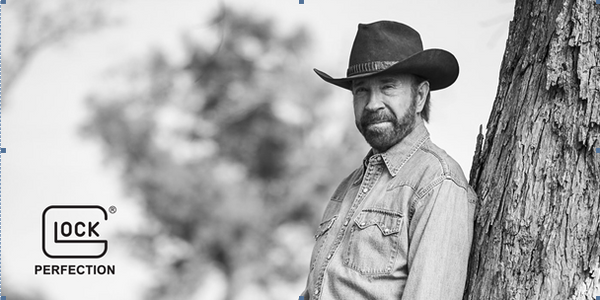 Winchester (www.winchesterle.com) introduced its new Ranger One law enforcement handgun ammo. Ranger One ammo features a bonded bullet design for optimal penetration; a proprietary rigid, fluid-directing polymer insert to facilitate expansion. Winchester says 147-grain 9mm ammo will be released this year, with additional calibers in development. 5.11 Tactical (www.511tactical.com) introduced the ABR Pro Pant, an evolution of the 5.11 Taclite Pro Pant that is designed to tackle both on-duty and off-duty wear. Features include nine total pockets, reinforced knees and seat, and a tool strap. Constructed of FlexLite stretch ripstop fabric for lightweight comfort and durability. First Tactical (www.firsttactical.com) showed its Defender Pant, which has 28 pockets. 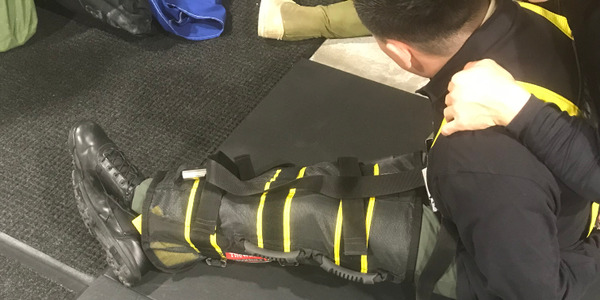 The company says the Defender is the first on the market to combine a Cordura nylon and cotton blend fabric with a mechanical two-way stretch to provide comfort and flexibility. The NYCO Fabric features no melt, no drip properties. Propper (www.propper.com) launched its new budget-friendly line of shirts and pants. The EdgeTec Collection includes polos, pants, and shorts that can be worn on- or off duty. All of the garments are constructed of lightweight 100% poly ripstop fabric for durability and comfort. Available in men's and women's styles. TruSpec (www.truspec.com) introduced the newest evolution of its 24-7 tactical pant. The 24-7 Series Pro Flex Pant offers a more tailored fit with integrated flexible panels on the hip, yoke, and above the knees for better movement. Constructed primarily of poly/cotton ripstop fabric, the Pro Flex Pant is built to be lightweight and comfortable. CZ-USA (https://cz-usa.com/) showed the Optics Ready versions of the P-10 pistol. The Optics-Ready P-10s ship with blank filler plates, and plates for both the Trijicon RMR and Leupold DeltaPoint Pro. Daniel Defense (www.danieldefense.com) is best known for making AR-style rifles and high-quality rifle parts but the company is making a different kind of long gun for 2019. 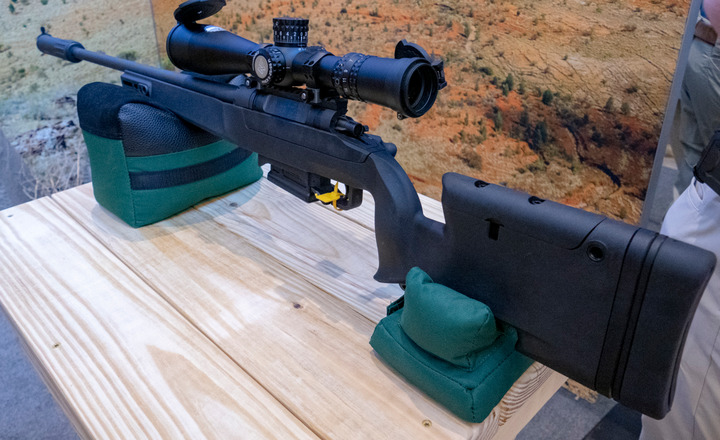 The new Delta 5 is a bolt-action rifle that features the modularity of the company's ARs. Daniel Defense says the Delta 5 is available in a variety of interchangeable barrel lengths for different calibers: 20 inches for .308 Winchester, 24 inches for 6.5 Creedmoor, and 24 inches for 7mm-08 Remington. FN America (www.fnamerica.com) released the FN 509 MRD pistol, an optics-ready duty pistol. 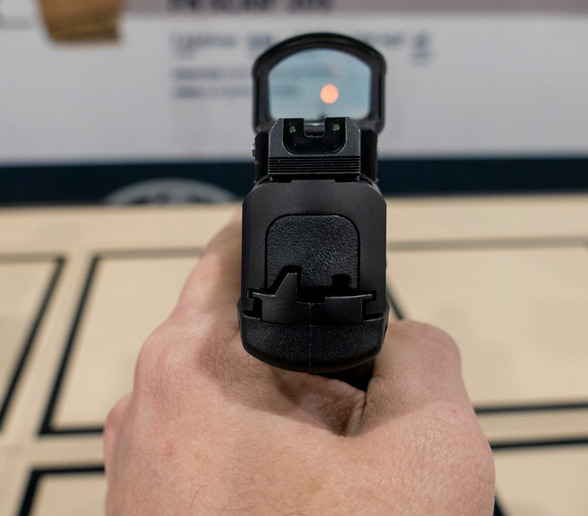 The company says the new FN 509 MRD was designed specifically for agencies considering miniature red dot optic-equipped pistols for their officers. The FN 509 MRD pistol features the company's patent-pending FN Low-Profile Optics-Mounting System. The optics-mounting system can accept more than 10 commercially available miniature red dot optics. Glock (www.glock.com) showed its new slimline pistols G43X and the G48. The 9mm pistols feature a compact Slimline frame for concealed carry. Both have a fuller-size grip length with a minimal profile of approximately 1 inch. 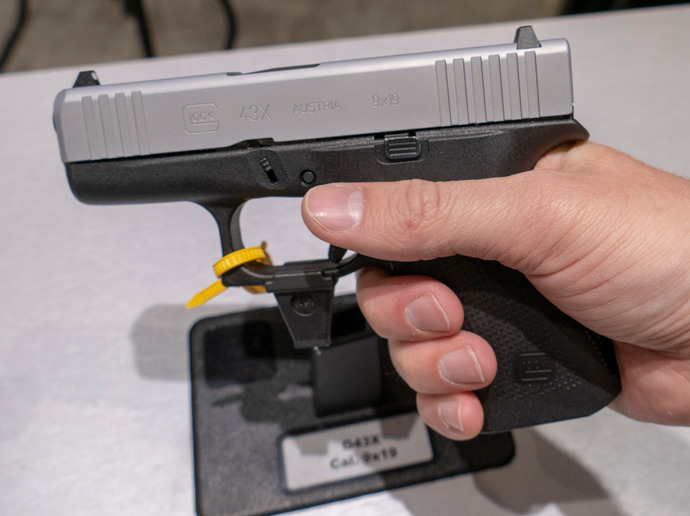 The slide for the G43X is the same sub-compact length as the G43 (6.06 inches) while the G48 has a compact length (6.85 inches). KelTec (www.keltecweapons.com) launched the KS7 shotgun. A smaller version of the company's KSG bullpup shotgun, the KS7 is a 12-gauge pump-action shotgun that holds seven 2.75-inch or six 3-inch shells. Mossberg (www.mossberg.com) surprised a lot of people at this year's SHOT by releasing a handgun. The company that is synonymous with shotguns released its first pistol since 1919. Mossberg's new MC1sc is a 9mm subcompact that weighs 19 ounces and has a barrel length of 3.4 inches. Rise Armament (www.risearmament.com) brought its Watchman Rifle to SHOT. The Watchman is a flat top AR developed with input from officers, and it is available in .223 Wylde and .300 Blackout. Features include a match-grade stainless steel barrel, black nitride-treated bolt carrier that the company says is easy to clean, a tactical 4.5-pound trigger, Rise flash hider, and a Magpul CTR stock. 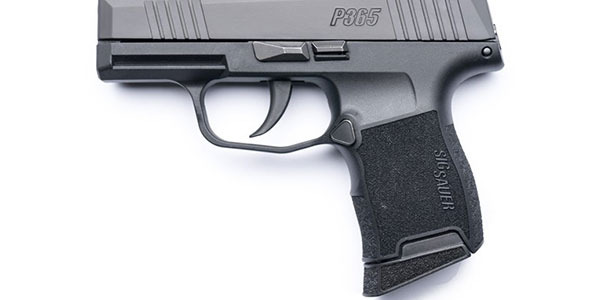 SIG Sauer (www.sigsauer.com) showed its P365 pistol. The P365 is a 9mm micro-compact pistol with a 3.1-inch barrel. It features a high-capacity, patented modified double-stack magazine for 10+1 capacity. Smith & Wesson (www.smith-wesson.com) showed its M&P Shield M2.0 line of concealed carry pistols. The 9mm compacts are available in a variety of configurations, including red or green laser sight models. 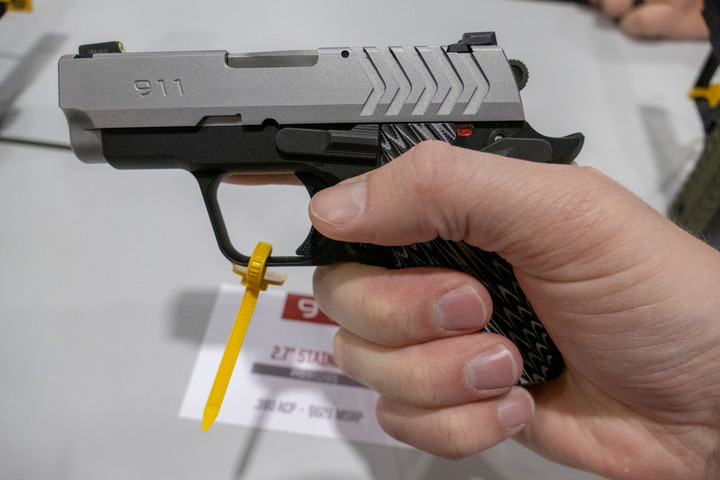 Springfield Armory (www.springfield-armory.com) announced the 911 pistol. The 911 is a micro-compact .380 or 9mm pistol that shares much of its form factor with the 1911. Springfield's 911 Alpha (.380) weighs 12.6 ounces and is 5.5 inches long. Yankee Hill Machine Co. (www.yhm.net) entered the bolt-action market with its MARC Chassis. The MARC is constructed of 6061-T6 aluminum with a type III class 2 hardcoat anodize, making it lightweight. The chassis is compatible with Remington and Savage platforms in both short action and long action setups. ASP (www.asp-usa.com) showed its Sentinel e3 and Sentinel X e3 triple fuel lights. The lights ship with a 16340 rechargeable lithium ion battery, but can run on a CR123A disposable battery or a AA battery. They can produce 400 lumens of output on the rechargeable battery, less with AA battery. First Light (www.firstLight-USA.com) brought its Tomahawk NV. Constructed specifically for operators with night vision requirements, the Tomahawk NV fulfills a number of potential light level demands. Functioning on two CR-123 lithium batteries, the Tomahawk NV provides white light as well as three Infrared output levels, and has an integrated 880nm IR beacon. Streamlight (www.streamlight.com) introduced several new illumination tools, including the Protac 90. The Protac 90 is the company's latest addition to the Protac series of tactical lights. The compact 300-lumen light features a 90-degree head for right-angle lighting, and also permits varied fuel options, including the use of a single CR123A lithium, AA alkaline, or AA lithium battery. SureFire (www.surefire.com) announced its Stiletto Pro slim-profile, high-output flashlight. The Stiletto Pro features SureFire's proprietary MaxVision Beam reflector and offers 1,000 lumens in high-output mode, 250 lumens in medium mode, and 5 lumens in low mode. A rechargeable lithium polymer battery and included micro-USB cable charger keep the Stiletto Pro powered. 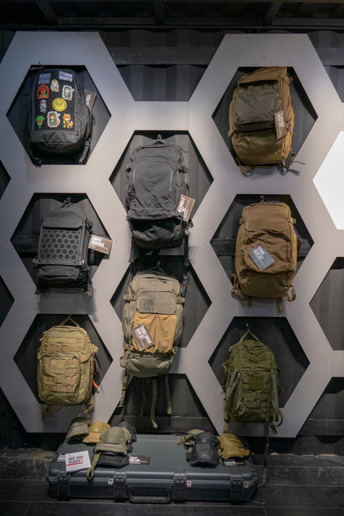 5.11 Tactical (www.511tactical.com) showed new models in its A.T.A.C. 2.0 collection. The new boots are substantially lighter without compromising safety and performance in the most unforgiving environments, 5.11 says. Danner (www.danner.com) brought its new Fullbore boot to SHOT. Available in Black, Coyote, and Gunmetal Gray, the Fullbore is a 4.5-inch boot that has waterproof features and Ortholite cushioning for comfort. Ridge (www.ridgefootwear.com) brought its newest duty boot, the Momentum 8-inch side zip. The lightweight duty boot has a full-grain leather toe, removable insole, and nylon loop speed lacing. Thorogood (www.thorogoodusa.com) brought its new 1274 Series boots. The 1274 is for the badge number of Det. Jason Weiland who served in an agency near Thorogood's Wisconsin headquarters and was killed by gunfire in 2017. Thorogood says the boots honor all fallen officers and the company is donating a portion of the proceeds to Concerns of Police Survivors (C.O.P.S.). The athletic shoe-inspired boots come in three versions: Oxford, 6-inch, and 8-inch. They are designed for duty and have Vibram outsoles, dual-density polyurethane midsoles, and lightweight mesh uppers. BlackHawk (www.blackhawk.com) showed its new Omnivore retention holster. The Omnivore can fit 150 different holsters, and it uses the pistols rail for retention. 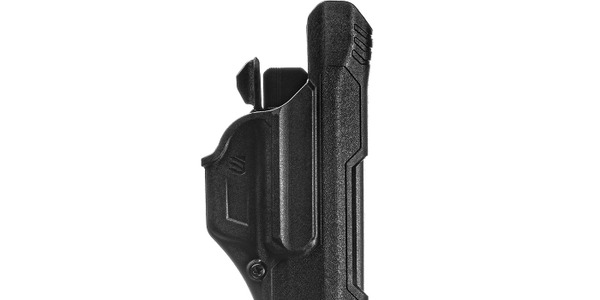 DeSantis (www.desantisholsters.com) brought its Infiltrator Air IWB holster to SHOT. The Infiltrator Air is adjustable for cant and height. Fabric on the back of the holster is synthetic and breathable—hence the name. Galco (www.galcogunleather.com) introduced the KingTuk Classic. The company says the new holster is an alternative to its KingTuk Deluxe IWB that provides comfortable carry, fast draw, and easy reholstering. KingTuk Classic has a smooth back plate that quickly conforms to the wearer's hip. Aimpoint (www.aimpoint.com) introduced the Acro P-1 optic at SHOT. This compact reflex sight was developed primarily for use on handguns but can be used on long guns. The Acro P-1 features a 3.5 MOA red dot reticle, and digital intensity adjustment switches that can be manipulated while wearing gloves. Burris (www.burrisoptics.com) showed its new XTR III front focal plane rifle scopes. The scopes are available in two models (3.3-18x50mm and 5.5-28x56mm) with three reticle options. 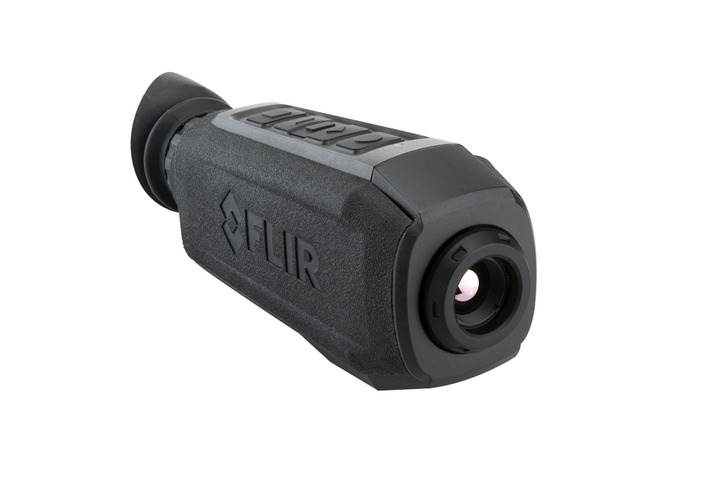 FLIR (www.flir.com) brought its new Scion PTM thermal monocular, which was developed specifically for law enforcement applications. The Scion is a high-performance thermal system with a 60 Hz refresh rate and picture-in-picture zoom for capturing details at a distance while maintaining situational awareness close in. Leupold (www.leupold.com) introduced the Freedom RDS (Red Dot Sight). The Freedom RDS will be available in two distinct models: one with ¼-MOA click adjustments, the other a precision exposed BDC elevation turret that ships with measurements out to 500 yards for standard 55-grain .223 Remington ammunition. The RDS is designed to install easily on AR-style rifles. Night Vision Devices (www.nvdevices.com) showed a very lightweight (less than 15 ounces) night vision binocular, the Mini B AAA. Available in 16mm and 18mm, the Mini B AAA has a runtime of 10 hours on one AAA battery. Primary Arms (www.primaryarmsoptics.com) announced its new line of GLx4 rifle scopes. The line includes three first focal plane scopes, the GLx4 2.5-10x44FFP, the GLx4 4-16x50FFP, and the GLx4 6-24x50FFP. All GLx4 scopes feature premium glass, elevation rotation indicators, patent pending Zlock and Zstop adjustment turrets, and AutoLive motion sensing reticle illumination. Pulsar (www.pulsarnv.com) showed its Accolade Thermal Binoculars. The thermal binoculars offer a 384x288 (XQ models) or 640x480 (XP models) sensor with 50 Hz refresh rate and feature a long detection range between 1,350 and 1,800 meters. Trijicon (www.trijicon.com) introduced a new line of Fiber Sights at SHOT. The Trijicon Fiber Sights are engineered to provide a brilliant aiming point while maintaining a refined sight picture. The highly visible front sight and subdued rear sight promotes front sight acquisition. The Trijicon Fiber Sights are designed to withstand daily pistol use. TruGlo (www.truglo.com) brought its new Ignite Mini compact 22mm red dot sight to SHOT. The ultra-lightweight sight features a 2 MOA dot, digital push-button brightness controls with 10 brightness settings, wide field of view, and auto-off feature. Armor Express (www.armorexpress.com) introduced a number of new products, including the Traverse Overt Patrol Carrier. This carrier easily converts from a concealable soft armor into a front zip-side opening system. It offers both MOLLE and Dress configurations along with optional features to meet departmental requirements. BulletSafe (https://BulletSafe.com) is releasing a uniform-style external vest carrier in 2019. The BulletSafe Uniform Vest Front Carrier offers customers a professional appearance with darts, buttons, and pockets. BulletSafe also offers a Tactical Style Front Carrier that features a MOLLE system for attaching accessories. The company says if customers buy its NIJ Level IIIA vest they receive the concealable carrier, then they can add the Uniform Vest Front Carrier and Tactical Front Carrier to have three different wear options. Revision (www.revisionmilitary.com) showed its Caiman Bump Helmet System. The Caiman is a lightweight polymer bump helmet that provides blunt impact protection and is designed for wearer comfort. Five sizes are available. Point Blank (www.pointblankenterprises.com) showed the SOB Tac-Wall, a modular shield system that offers rifle protection. The shields can be used individually or linked to form a freestanding wall. SOB says the concept behind the Tac-Wall is that officers can carry one shield each in their patrol vehicles and combine them if needed during a critical incident such as an active shooter attack. Safariland (www.safariland.com) showed its Protech Tactical Hi-Viz Shield, a clear NIJ Level IIIA shield made of a polycarbonate composite to allow officers to see threats from a wide perspective. Team Wendy (www.teamwendy.com) is now offering a ballistic mandible for its ExFil ballistic helmets. The mandible has been tested to protect the wearer from 9mm rounds stepping out at 1,400 feet per second and from blunt impact. U.S. Armor (www.usarmor.com) showed its complete line of external vest carriers, including uniform style carriers and tactical systems. Available in a wide variety of colors and styles, the carriers come in smooth and MOLLE versions. 5.11 Tactical (www.511tactical.com) introduced the LV18 tactical backpack. The LV18 launches in Spring 2019, accompanied by a smaller sling pack model the LV10 that can hold a short-barreled rifle, and a crossbody/waist pack model, the LV6 that can hold a pistol. Columbia River Knife & Tool (www.crkt.com) introduced a new knife designed for law enforcement officers at shot. Designed by Joe Caswell, the Provoke is a Karambit style knife that features Kinematic opening for safe carry and rapid deployment. To open the knife, all you have to do is push down, and the blade is ready to work. Datum (www.datumstorage.com) displayed its ArgosSecurity weapons storage systems. These welded steel systems are available in a variety of sizes and security levels and are NTOA member tested and recommended. Ear Phone Connection (www. EarPhoneConnect.com) showed its iBUD PTT, Snake i-Pod Style Kit. Designed for mobile surveillance in highly trafficked areas, the iBUD PTT, Snake i-Pod Style Kit gives investigators a leg-up on covert surveillance missions by looking like cellphone headset technology. The iBUD PTT and Snake i-Pod Style kits give the appearance of white or black wired earbud headsets while providing push-to-talk communications with numerous two-way radio systems. Hogue (www.hogueinc.com) introduced a bunch of new duty pistol grips at SHOT, including Beavertail Grip Sleeves for the Glock 17, Glock 19, SIG P320, SIG P365, and Ruger Security-9. Also new for 2019 are grips for concealed carry pistols including the Kimber Micro 9, Ruger LCR, Kimber K6s, and Springfield Armory 911. Pelican (www.pelican.com) brought its new long Air 1745 case to SHOT. Air cases are 40% lighter than other polymer cases of the same size and dimensions, the company says. The Air 1745 is 44.01x16.77x7.94 inches and features wheels for easy movement.